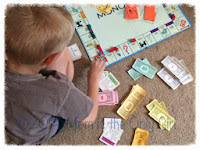 I had done some research earlier this spring, looking for some fun ways for Cutie Pie, age 7, to learn about money. I cut out pretend coins and bills, found some fun little money games and was all set. (I found Counting Coconuts to have some great printables to use.) I introduced these items to the boys and they were totally not interested. 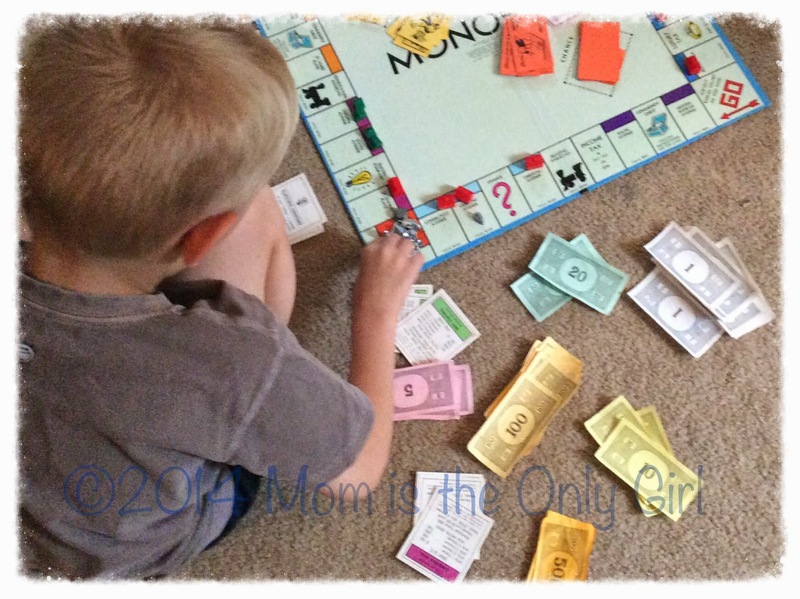 The other day Cutie Pie found the Monopoly game in the closet. He begged us to play the game, so I set it up, gave him a brief rundown of the instructions and we began to play. By the end of the day Cutie Pie had figured out how paper money works! He was counting, adding, subtracting, charging us rent…I think he learned because it was in a way he wanted to learn. Now just to figure out how he’ll learn about change! Following are just a few of the sites that were part of my research. I’m listing them in hopes my coming across them will be helpful to others. (These are not affiliate links, simply resources you may chose to look at.) There are, of course, many others, but these had good ideas including ways to involve your child in saving and truly learning the power of money in the real world.